PLEASE NOTE - there are no physical tickets issued for these events, your PayPal email receipt is all you need to bring! Three plots in three different historical periods—prehistoric times, ancient Rome, and modern times (the Roaring Twenties)—are intercut to prove the point that men's love for woman have not significantly changed throughout history. 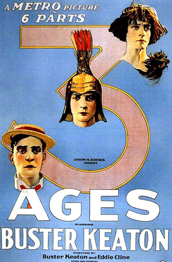 In all three plots, characters played by Buster Keaton and Wallace Beery compete for the attention of the same woman, played by Margaret Leahy. Chris Maric is a Calgary-based musician who has performed and worked with Cantos Music Foundation and a wide variety of musical groups across the country. Chris’ passion for creating live soundtracks for silent movies is evident in his performances, both musically and visually. For this performance, Chris will be performing solo with an assortment of instruments courtesy of Cantos Music Foundation, coupled with an exuberant energy for a performance that is not to be missed. Audience members are invited on stage after the performance for an opportunity to try out some of the instruments. Join us on Sunday March 3rd, 2013 at 1:30pm for this special event for the whole family.